Dr. Ian Malcolm‘s paleontologist girlfriend, (S/F-T/G element) Dr. Gerry Harding‘s daughter, and Jess Harding‘s half sister (end of S/F-T/G element). Dr. Sarah Harding first met Ian when she’d heard the rumors about the incident at Isla Nublar. She came down to the hospital in Costa Rica where he’d been sent to recover from his injuries to ask whether the rumors were true. They started dating after that. A specialist in dinosaur parenting behavior, Sarah was one of those who theorized that the Tyrannosaurus rex was a caring, attentive parent. Her chief rival was Dr. Robert Burke, whose own pet theory was that T. rex was a rogue who abandoned its young early. When Dr. John Hammond needed a paleontologist for his research team he was sending to Isla Sorna, Sarah immediately volunteered. She did this without Ian’s knowledge, since she knew if he found out she decided to go he’d do everything he could to stop her. She went to the island ahead of Nick Van Owen and Eddie Carr and met them and Ian, who she was surprised even came, later when they arrived. While she was thankful that Ian had come to “rescue” her, she told him as politely as possible she didn’t need rescuing and could handle herself. When an infant Tyrannosaurus was injured by Peter Ludlow and his hunters, Sarah and Nick brought the baby back to the trailer. It was Nick’s idea, and at first Sarah wanted nothing to do with it. They fixed its broken leg, only to be attacked by the angry parents looking for their child, clarifying Sarah’s theory on T. rex parenting. Later, it was her jacket stained with the baby’s blood that again attracted the Tyrannosaurus parents, resulting the deaths of several hunters and almost her own. 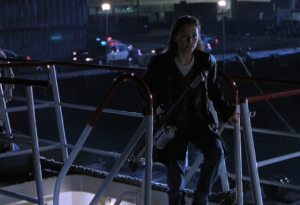 When the male was taken back to San Diego by Ludlow and escaped, it was Sarah who tranquilized him so that he and the baby could be safely returned to Isla Sorna. 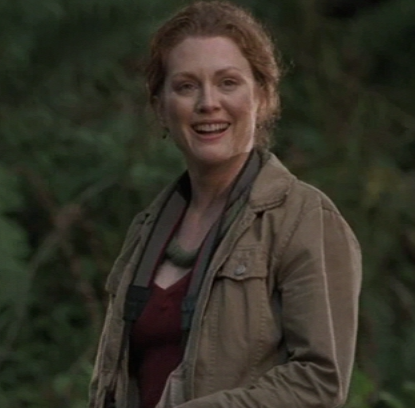 Dr. Sarah Harding was played by Julianne Moore.